Barbara's has launched its Pumpkin Puffins cereal. It will be on store shelves for a limited time. This is the second season for the cereal which debuted last year. 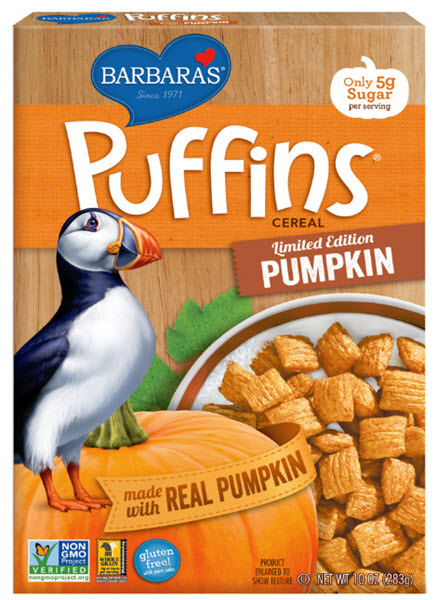 Pumpkin Puffins are a pumpkin version of Barbara's signature line of Puffins Cereal. They are a crunch, pillow-shaped cereal lightly sweetened with real pumpkin. They contain contain 8g of whole grains and 3g of fiber per serving. They are Non-GMO Project Verified and made without hydrogenated oils and high fructose corn syrup. Tim Kenny, Director of Marketing at Barbara's, says in the announcement, "It's important to us that we listen to what our customers want, and given that Pumpkin Puffins was such a crowd-pleaser last year, we wanted to offer people the opportunity to enjoy it again. We love creating delicious and fun new flavors that provide a clean nutritional profile, and Pumpkin Puffins delivers on just that. It's a perfect and wholesome way to take care of your pumpkin spice cravings this season!"